Melissa Kosinski-Collins was recently promoted to Professor of Biology. Melissa joined the Biology faculty in 2006 as an Assistant Professor (outside the tenure structure). Using her passion for teaching, she has updated the undergraduate laboratory curriculum to a system of project-based experiments. Currently, she is teaching the introductory biology lab course, plant biology, and a graduate level structural biology course. Melissa is the academic director of the Science Posse and Galaxy Project. Five Brandeisians (past and present) have received NSF Graduate Research Fellowships for 2018. Also, one current graduate student received an honorable mention. 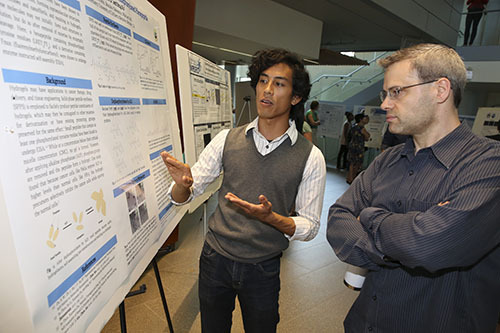 This program recognizes and supports outstanding graduate students in NSF-supported STEM disciplines who are pursuing research-based advanced degrees at U.S. institutions. In 2018, the National Science Foundation (NSF) received over 12,000 applications, and made 2,000 award offers. This fellowship provides three years of financial support within a five-year fellowship period ($34,000 annual stipend and $12,000 cost-of-education allowance to the graduate institution). 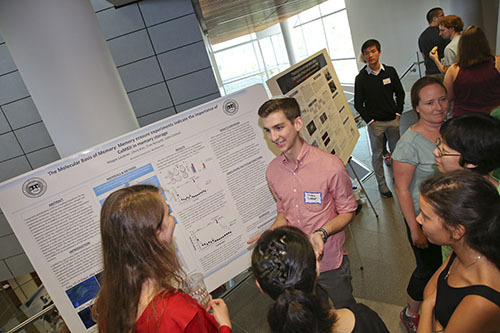 Christopher Konow, a Ph.D. candidate in Chemistry, received an honorable mention. He works in the Irving Epstein lab analyzing the Turing Pattern formation in Growing Domains using the CDIMA (chlorine dioxide-iodine-malonic acid) chemical reaction. For the NSF GRF, he proposed developing a novel self-oscillating hydrogel that could have uses in drug delivery. He plans to start this project in late summer/early fall of 2018. Caroline Cappello graduated in 2011 with a bachelor’s degree in Environmental Studies and Theater Arts. She is a Ph.D. student in the Department of Biology at the University of Washington. Emma Chad-Friedman received a BA in Psychology and Anthropology in 2014 and is in the PhD. Psychology program at the University of Maryland at College Park. Jung Park also graduated in 2014 with a degree in Neuroscience and Psychology. He is currently a Ph.D. student in Neurobiology and Behavior at Columbia University. Stanislav Popov received his B.S. degree in Mathematics and Chemistry only 2 years ago (2016). 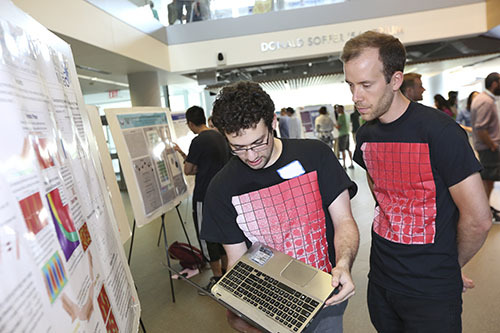 While at Brandeis, Stanislav worked in Isaac Krauss’ lab. He is pursuing a Ph.D. in Chemistry at UCLA. 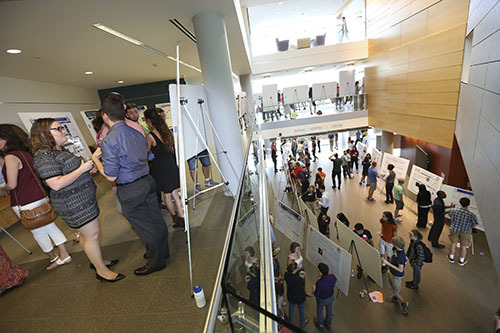 The Brandeis University Division of Science held its annual undergraduate research poster session SciFest VII on August 3, 2017, as more than one hundred student researchers presented summer’s (or last year’s) worth of independent research. We had a great audience of grad students and postdocs (many of whom were mentors), faculty, proud parents, friends, and senior administrators. More pictures and abstract books are available at the SciFest site. 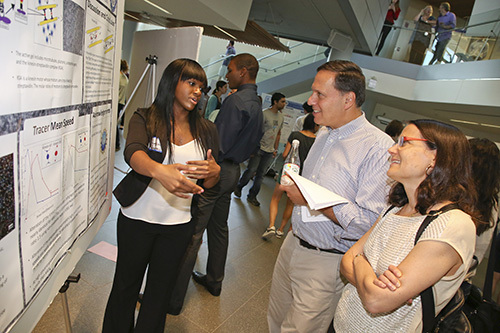 Summer Materials Undergraduate Research Fellowship (SMURF), supported by the Brandeis Materials Research and Engineering Center. After 25 years at the helm of the Brandeis Genetic Counseling program, Judith Tsipis has handed over the leadership reins to Gretchen Schneider. 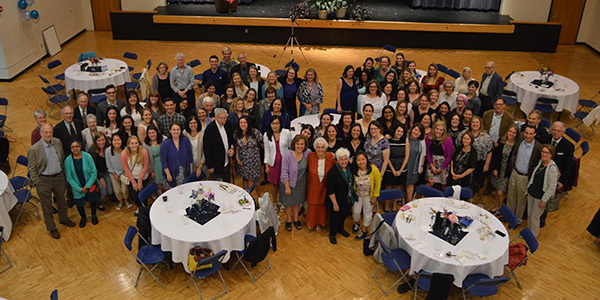 On June 3rd, close to 100 people gathered in the Levin Ballroom at Brandeis to honor and celebrate Judith’s illustrious career as a pioneer in the field of training genetic counselors. Attendees included over 40 alumni, former and present faculty members, family and close friends. Highlights and memories were shared by: Beth Rosen-Sheidley, an alum from the first graduating class in 1994; Kathryn Spitzer Kim, the first Assistant Director from the Program; Gretchen Schneider; Judith’s son Yanni and husband, Kosta; and two additional alumni, Christa Haun and Jason Carmichael. 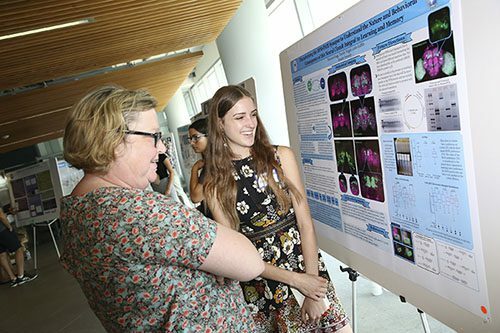 Judith created the master’s program in response to her own family’s experience with Canavan disease, a recessive degenerative disorder that causes progressive damage to nerve cells in the brain. Brandeis admitted its first class in 1992 and is proud to have over 200 alumni. 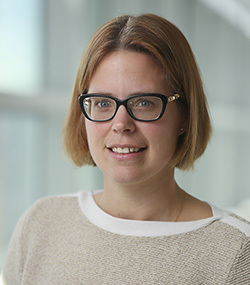 Judith will continue to be involved with the program in various capacities: coordinating journal club, serving as a thesis advisor and member of the Advisory Board.